Hey everyone. Joe here, to offer you another gimps at the latest edition of Another Videogame Webcomic! I thought it would be fun to share with everyone some thoughts on the process of figuring out the characters and putting the pieces together. 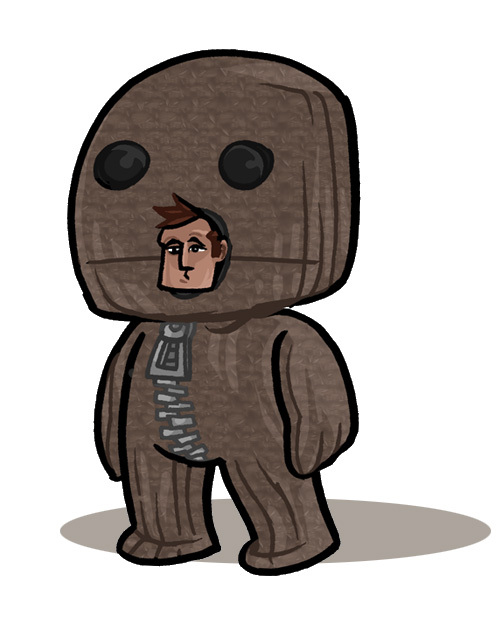 When Phil told me the script for the latest AVW comic, about LittleBIGPlanet, I had no clue how to execute it. It featured the characters in the game, something that will be a running theme throughout the strip (see last weeks Pong Paddle joke), but difficult considering the LBP Sack Boys and Girls aren't exactly... human like. With each trip inside the games I'll have to encounter the challenge of making the characters recognizable as the both the characters in the game as well as the characters in the comic. For example, you'll have to be able to look at the image and see both Player 1 and Mario at the same time. That's nothing a set of overalls and a nearby sparkling star couldn't solve, but how do you achieve the same thing with one of the overstuffed, zipped up little LBP Sack Boys? The finished comic came out well, a step up from the sketch but a touch too much texture in the characters themselves. The learning process continues, right? The exciting (and potentially frustratingly debilitating) thing about Another Videogame Webcomic is that I�ll be encountering new challenges of design and character ever week.